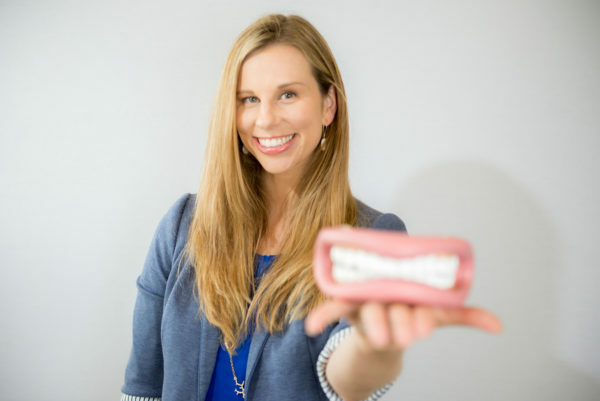 As a Pediatric Speech Pathologist who specialized in working with young children, every day I get to work closely with toddlers and their families. 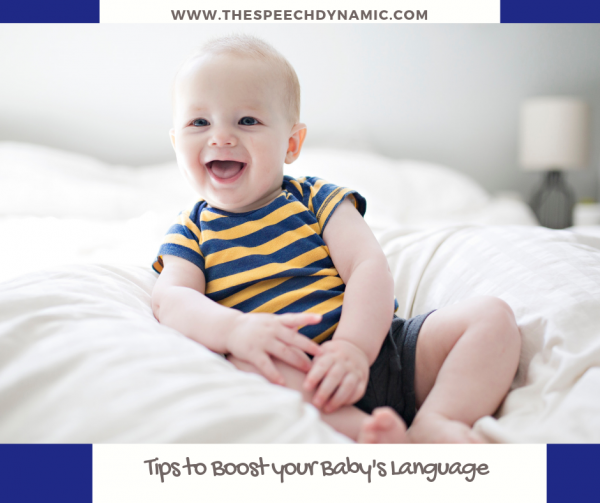 The following are tips I consistently share with families to help their little ones as they are accomplishing the amazing task of learning language! Use child directed speech: Talking in this way (elongating vowels and using pitch swings…otherwise known as “baby talk”) helps babies to make the discriminations between sounds and words. In one study, babies could tell the difference between the made-up words “malana” and “marana,” but only with they heard the words produced in a sing-song pattern. Baby talk exaggerates sounds so babies can hear the differences. Talking in this way clues children in that the language is meant for them. Toddlers 18-24 months learn words better when they are delivered in child-directed speech. Studies by Hirsh-Pasek & Golinkoff showed that babies only learned new words when they were delivered in infant-directed speech. It wasn’t until 34 months of age that toddlers could learn new words whether they were spoken in child-directed or adult-directed speech. Find out more about how baby talk helps language here. Place unfamiliar/new words at the end: Putting new words at the end of a phrase puts heavy stress on them. This helps your toddler remember words better. In one study, Turkish and American mothers were asked to teach their 12-month-olds three new words; “lips, “wrist, and “lobe.” Both the American and Turkish mothers tended to put the new words at the end, even though verbs typically end a sentence in the Turkish language. Putting the words at the end made them stand out more so the children could learn them more easily (Hirsh-Pasek & Golinkoff, 2000). Follow their lead: Talk about what your baby is interested in. In one study, babies who had mothers who followed their lead and responded to what their baby was interested in at nine months had larger comprehension vocabularies at thirteen months. 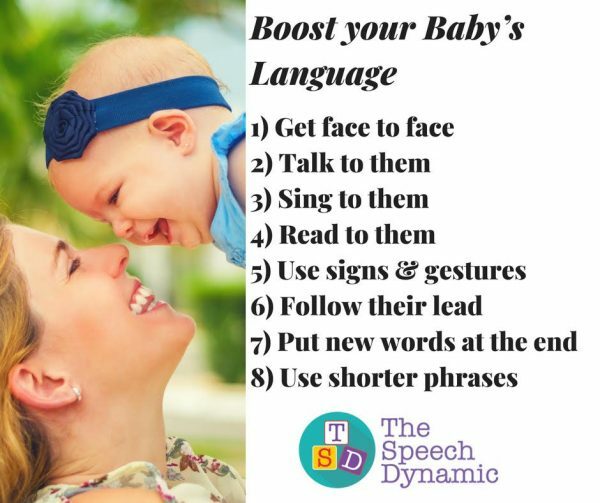 In other words, following your baby’s lead and honoring their communication contributes to language growth (Hirsh-Pasek & Golinkoff, 2000). Use shorter sentences with longer pauses: Babies are tasked with the job of segmenting streams of language into words, phrases, and sentences. Babies use clues such as finding pauses and commas in spoken language. They are also sensitive to stress patterns. In one study, English and Dutch babies preferred to listen to recordings in their own language. This tells us that babies really are listening to the sequence of sounds and how they make up language! This is how they know the phrase little-doggy is two words. Le-do does not occur in English. Therefore, it must be two words. Babies are constantly doing this type of statistical analysis to learn language (Hirsh-Pasek & Golinkoff, 2000). Get face to face: Newborns prefer to look at faces. Babies who were nine-minutes-old and had never seen faces before preferred to look at a drawing of a face that was anatomically correct (the delivery staff covered their faces for their experiment). “Paying attention to faces and to high pitched voices allows babies to look for just the right information in the environment to learn more about their words” (Hirsh-Pasek & Golinkoff, 2000). As babies get older, getting face to face stimulates vocalizations for early back and forth “conversations.” Research shows that when adults looked four-month old babies in the eye, they babbled more (Hirsh-Pasek & Golinkoff, 2000). Getting face to face allows for more connected communication. It allows your child to watch your face to learn emotions and attend to your mouth as your form words. From another perspective, don’t you prefer face to face communication with other adults? Talk to them: Babies learn language through hearing language. The more we talk to them, the more “material” we give them to segment and understand how language works. A baby’s brain is developed through interactions with their caregiver and environment. Every time your baby is talked to, cuddled, fed, played with, or sung to, the brain develops (Fox, 1988). By age three, 80% of the brain is wired and by age one, children have learned all the sounds in their native language. Talking to children helps them learn the language and provides the type of interactions necessary for brain development. Use signs and gestures: Signs are an excellent way to help your baby communicate and bridge the gap between what they understand and what they can say. In one study, babies who had been taught baby signs knew an average of fifty more words at the age of two (Acredlo and Goodwyn). Pairing your own words with gestures make the words stand out more and therefore easier to learn.Pairing your words with gestures such as pointing also helps by showing babies how to use gestures as communication. Scientists have noted differences in when babies first start to point and when babies first start to talk. Babies who point early also seem to acquire their first words early. (Hirsh-Pasek & Golinkoff, 2000). Sing to them: Singing songs to children teaches them how language works. Songs and rhymes teach rhythm, rhyme, and repetition, later needed for reading. Rhymers are readers; children who have a good sense of rhyme are able to make smart guesses and predict that certain words, patterns, and plots will occur in stories *Fox, 1988). In fact, if children know eighty nursery rhymes by heart by the time they are four, they’re usually among the best readers (Fox, 1988). Hirsh-Pasek, K., & Golinkoff, R. M. (2000). How babies talk. London: Robinson.